Good morning guys! Here is our first bit of liveblogging from the #a4uExpo here in London. We'll be bringing as much info to you as we can over the course of the day and welcome any feedback or thoughts in the comments! Our first post is about a presentation from Dave Naylor of Bronco SEO. Webpage Test – great tool for testing site speed. ”You don’t want a Ferrari that only does 60 mph” – server loads are huge. And if your server can't handle it you will find yourself in trouble." Dave mentioned a friend of his who had a site that's server couldn't handle over 100 visits at any given time. As a result he was seeing 999-1001 visits from Google. It appears Google has effectively limited the amount of traffic it will send the site on a given allotment over the course of the day. I've not seen this but it seems pretty cool! Bing’s webmaster tools is really coming on. Dave says he would rather use Bing than Webmaster Tools if he was able to do so for all of his needs, but suspects it is not too far off now! If you ever want to waste a few months of your life run IIS across a large site. The tool can give you loads and loads of information (really probably too advanced and too much information in some cases) but great for some finite tasks and for checking for duplication of links and so forth. Dave touched on a number of reasons why your development team needs to be savvy and some key areas to focus on when working on development (new sites and so forth). This is something that I also plan on touching on in my presentation tomorrow but it is extremely important that people aren't too cautious with this. Robots.txt, IP addresses, passwords (lock down your site to make sure it’s not accessible and it is protected). Never do big dev launches on a Friday. Make sure the certificate follows suit. Never use a 200 response to redirect a page. If it’s not a hard 404 you’re leaving your site vulnerable. Getting the URL structure correctly is essential. Google says they get everything and figure it out, it’s rubbish. USE REL=CANONICAL! It works much better than some of the alternatives despite what Google (or anyone else may say). Incororporate a sitemap and breadcrumb trail - this is a minor thing but you'd be foolish to overlook it. Release some pages off at a time (10,000) – send Facebook and Twitter traffic (linkbuild like hell for a while) and then release from Robots.txt. It will take loads of new content all in one go rather than indexing a few pages at a time and kicking lots of these pages out of the index. This can be essential for getting these pages to stick and not take up the "allotted crawl" There is no attrition here, takes everything into the index almost immediately. As soon as they’re all indexed release a few more. Makes Google hungry for the info. (GREAT pro-tip). Use good practices- make it WCC compliant. Make it tableless, CSS, HTML 5 if you can. Dave told a story of a white hat hacker friend of his (allegedly working for the good guys) where he said: this guy can look at the code and if so much as one comma is out of place a hacker knows it’s sloppy and knows he can probably get in to the site and do some seriously malicious stuff! Content at top of source- Dave likes his site to look ugly with CSS disabled. He wants as much information to Google as possible and wants to make it as easy as possible for them to find it. Use alt tag where acceptable. Dave mentioned that he's seen some cases where people are really lazy about this -you need to avoid duplication here just like you would with any of the Metadata! Meta descriptions: Miley from Google said that meta descriptions are a ranking factor. If you put a keyword in the description that can't be found anywhere else on your site it's not going to help. However, if it matches up with the rest of the site you WILL see an uplift – both in terms of CTR and rankings. Dave hinted that his advice to make them longer though was a bit hush because it was someone else’s pro-tip so didn't want to go into this any further. Be descriptive, be unique, don’t go overboard! Google is “getting there” in terms of going after over-optimised content and although they may not penalise anyone yet, they are probably not too far off! No backlinks necessary! Dave spoke of a case where he was able to get got a good site ranking for a competitive term. Think about phrases and adwords- linking structure should be focused on phrases, not on a single keyword! Side note here from my (Sam) own personal experience- this has been talked about over on the SEOmoz blog a bit but anchor text with overtargeting (one specific term rather than a variety of keyphrases) does seem to be causing some problems for folks! If you make use of this, then you can save your external links and use them sparingly with the really rich anchor text. Get an SEO involved/let them lead the charge. It’s not rocket science but so many companies do it. “Don’t have a million versions of the homepage” (e.g. example.com/, www.example.com, www.example.com/index.html, etc). Navigation: don’t go more than 3 levels deep if at all possible. 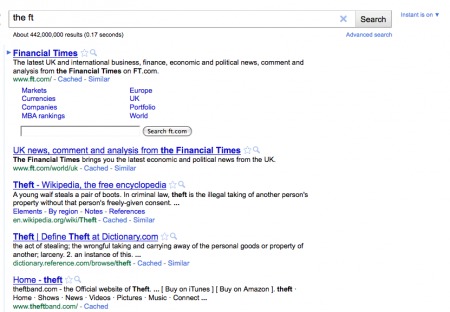 Use keyword rich navigation tabs. You can use Ajax and Java but be sure to give Google a cached HTML version. Check existing traffic for converting keywords and page 2 terms with the volume for these terms. Try to push these page 2 terms on through to page one. Targets should be based on strength of competition and time/money needed to be spent. Take out your brand keywords for CTR analysis. Check position you’re in and intelligently guess how much better you would be getting from a higher place. You can probably estimate the percentage based on where you are and how much better off you’d be better off in first place, it may or may not be worth going through the trouble. You have GOT to check the conversion data if you have it – if the conversion rate is really low, ranking first for the term may not be a top priority. Along these same lines Dave mentioned that he was able to get one of his sites up to Position 5 for forex only got 23 visits a day. Data can be EXTREMELY far off (the data Google provides you) even if they say there is low volume you should test it. Only real way to find out what the volume is like is to try to rank for it yourself. IF YOU HAVE A BIGGER BUDGET USE OMNITURE rather than Analytics (interesting shout). Dave suggested that Omniture is much more powerful and provides some much more attractive information. For ranking Dave suggested AWR (advanced web ranking) – great for competitor analysis. Check across 1,000 keywords, relative score on traffic, etc. Relevance- no one wants to read an ingfographic from myvouchercodes on floods in Pakistan. Infographics work very well at the moment but if people abuse this too much Google will probably step in and it will stop working. Set targets- plan to write one post a day. Product review? Book review? Waffle on about things you’ve seen on the internet. Majestic SEO – loads of historical data ~$250/month for api access. Syntryx is the best (like hitwise for links) however it is outrageously expenseive. Google tell you what works- just read the SERPs and TEST EVERYTHING! Don’t believe anything that anyone tells you about backlinks. First link discussion for example - according to Dave the first link rule is true but it's so easy to test for: set up two links and see which one comes through on Webmaster Tools (or elsewhere). If both were to show up this would be rubbish, if only one ... well, there's your answer. It is not hard to do, but just do it! Tests Dave and his gang have done: Will Google put broken u words together? The FT (will bring back theft), search for Will.i.am you will get back info on William. And sure enough it’s true (see below). 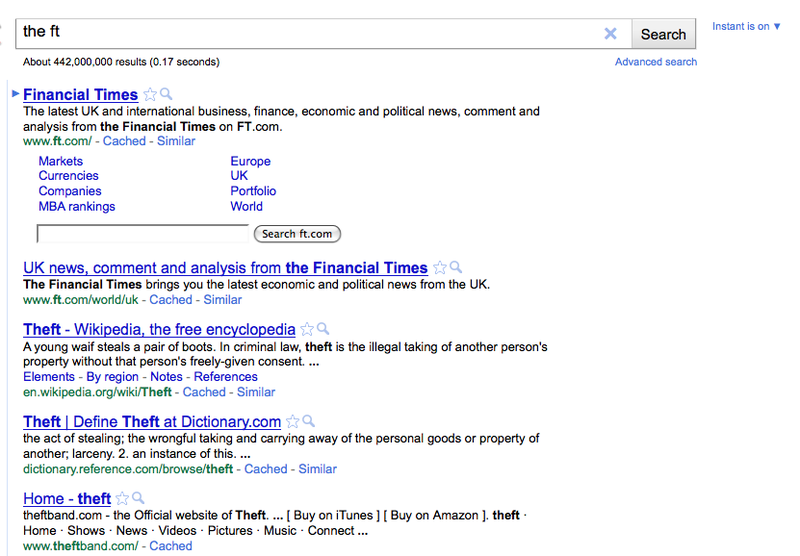 The FT still ranks first but theft is the next logical thing in Google's mind. Why is that ranking? Spider a site, look at the site. How do your rank for something you don’t even mention the site on, and have no inbound links with that anchor text. Dave has seen too many examples like this to say that he definitively knows the secret to getting a site ranking or how Google works. There is no secret no “I’ve found it”, but there are ways to figure out some ways to get in there. Go for the middle ground – if you’re a new site don’t focus on getting a link from the industry leaders, go for middle of the table! Look where you are and what is common in your industry! If no one else has a PR 9 in your entire industry, do you think it’s going to look natural when you get it? People will like naturally if the content is quality. Go for easy wins initially, then scale up. Dave had some very candid words about buying links but I should at this point probably emphasise that this is our coverage of the event, not advice provided by Distilled. Car Insurance – no one in the top 10 that haven’t bought any links. In some industries there is a lot more lleway. 2. Avoid sitewides (in content) when possible. There is always a chance it’ll work but in content is better. 3. Buying links from sites that advertise they sell links you’d be an idiot to buy. Think “if Matt Cutts saw this link what would he think? If I meet him, could I lie with a straight face and convincingly?” If you can’t do this, don’t do it. 5. If you find a competitor going after you do the same to them – see how they like it. That was pretty much his conclusion and this presentation was FULL of great/actionable tips. For more on the same, I'd be remiss not to mention that Dave will be speaking at the Distilled PRO seminar and we strongly suggest you get your ticket and check him out! Next-up "Negative SEO" - Really looking forward to this panel- lots of big names!